Just under an hour’s drive from Edinburgh and Edinburgh Airport with its national and international connections, and under half an hour from Perth, Kinloch House Hotel is the ideal ‘get away from it all’ location for UK city and internationally based companies. It is perfect for entertaining key clients, to showcase a new product, to host a executive board meeting – or a business training day – or quite simply to say thank you for a job well done. Kinloch House Hotel is a real “jewel in the crown” of executive class business venues in Perthshire, indeed in the whole of Scotland. 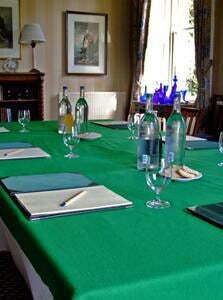 Perfect for business leaders wishing to get together in private and without distraction. In a sensationally beautiful, quiet location with stunning views from the meeting room and lounges. Delegates enjoy the highest standards of food and wine, luxurious accommodation and excellent service. Privacy and confidentiality with no distractions other than coffee, buffet luncheon or afternoon tea, are assured. The hire of conference equipment can be arranged. Plenty of free car parking on site, and free wi fi throughout the hotel. This fine luxury hotel in the heart of Perthshire is ideal for guests who want to combine small, exclusive events, “wine and dine” occasions, meetings or conferences with wonderful surroundings, luxurious comfort and total relaxation.